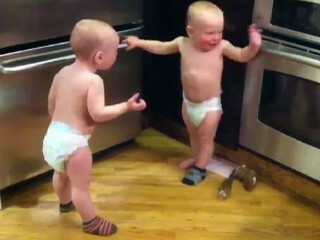 What seems to be small talk... turns into a full fledged conversation between two twin babies. It's a story that has caught the attention of ABC's World News & Good Morning America. The original YouTube clip can be seen below. You can share this story with your Facebook friends by clicking LIKE or hitting "SHARE" on the right side of the screen. And you can send this story out as a Tweet with the button on the right. Enjoy! To see another story about a baby being scared by her mother's nose blowing: click here. Leave your comments below using Facebook, or click LIKE and share this story with friends.